Rockland St. Mary lies in the Yare Valley between Surlingham and Claxton. The long village street, which runs from west to east, finally drops down a steep hill to the New Inn and the staithe. The staithe connects the village to Rockland Broad. The name Rockland derives from 'rook grove' - a fact which the nature writer Mark Cocker found particularly fascinating. Cocker, who lives in the next village of Claxton and is author of Crow Country, spent many years observing crows, rooks and jackdaws in the Yare valley. He was originally inspired by watching the amazing roost which takes place just across the river at Buckenham. However, like many villages surrounding Norwich, Rockland is now largely a commuter village. Out to be a rabbet wot hed drownded. An ole glove wot someone must hev hulled out. Rockland Broad was also home to two of Norfolk's most colourful characters. The first was Jimmy 'Scientific' Fuller who made his living around the turn of the 18th/19th Century shooting and collecting birds. He was even known to shoot ospreys. He worked on the broad for fifty years and can be seen (below) in his gun punt. 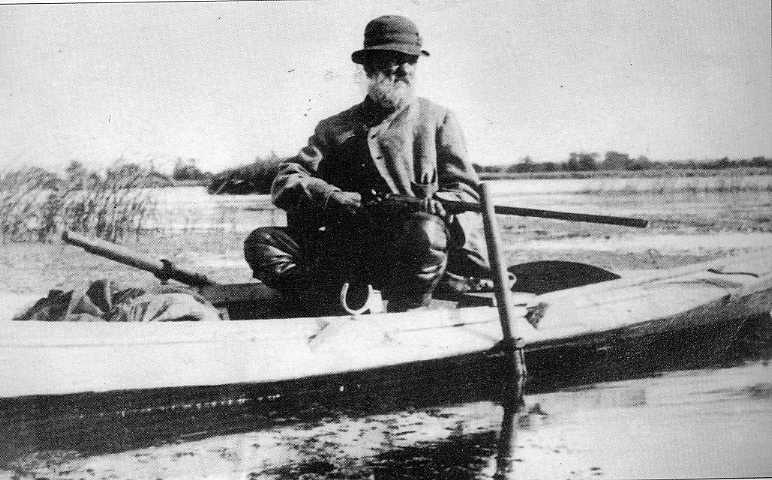 The other character was Archie Taylor, who lived in a thatched cottage on the staithe, cut reeds and hired out rowing boats. According to fishing legend John Wilson, Taylor was also a dab-hand at catching specimen roach using a wet fly. The old wherries - pike.